GAITHERSBURG, MD, August 29, 2013 (LifeSiteNews.com) – LeRoy Carhart’s late-term abortion facility has seen its share of protesters, especially since the death of 29-year-old kindergarten teacher Jennifer Morbelli. But a new face has been seen outside the Germantown, Maryland, facility: The Mother of God. 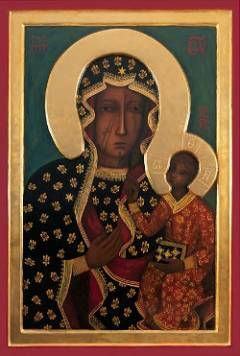 This reproduction of the icon of Our Lady of Czestochowa, known as the “Black Madonna,” arrived on American soil this week for the latest leg of a worldwide pilgrimage to defend human life, thanks to Human Life International. The icon of Our Lady of Czestochowa, is an image of the Virgin Mary holding the infant Jesus. It is beloved by Roman Catholic and Eastern Orthodox Christians alike. At one of its first stops, pro-life activists from the Washington area carried it on the front lines of a prayer vigil at the notorious Carhart facility. Father Peter West of Human Life international told LifeSiteNews.com he was inspired to bring the Black Madonna to the abortion center after hearing of the ancient Russian Orthodox tradition of carrying icons onto the front lines of important battles. Activist Ellen Castellano, a regular attendee of prayer vigils at the clinic, credited the presence of the “Black Madonna” with an unusually fruitful morning of prayer and peaceful protest. Castellano reported that a pro-life sidewalk counselor had a 30 minute conversation with one of the primary clinic workers. Sidewalk counselors were able to save three babies from abortion between 8 a.m. and noon, while the icon was present, Castellano said. Fr. West recalled the story of a group of Polish faithful who prayed before the icon at Jasna Gora in 1979 for Pope John Paul II to be allowed to visit the country, his homeland, then under communist control, with no restrictions. To the world’s amazement, the visit was permitted, which many credit with lighting a spiritual fire under the Polish people that led to Solidarity and the ultimate fall of communism in Eastern Europe. “We’re hoping that Our Lady will give us a similar victory over the culture of death,” he said. According to Christian tradition, the icon was originally written nearly 2,000 years ago by St. Luke the Apostle. The original icon is said to have traveled many places and survived numerous physical attacks during battles before arriving at its final home at the Jasna Gora monastery in Czestochowa, Poland. The original carries numerous battle scars which have either resisted repair or mysteriously reappeared after having been repaired. The icon currently traveling the world on the pro-life pilgrimage is a faithful reproduction of the image, which was blessed by Archbishop Stanislaw Nowak of Czestochowa in January 2012 during a special ceremony at the monastery. Fr. Roman Majewski, prior of Jasna Gora, said the pilgrimage has “enormous significance” in the struggle to protect the dignity of all human life. The icon has already traveled over 40 thousand miles, traversed 24 countries, visited 75 cathedrals and 60 Orthodox churches in over 400 cities; and been venerated by hundreds of thousands of Christians since the campaign began in Europe last year. The icon is scheduled to travel through the U.S. and Canada until November 2014, when it will be taken to Mexico for the next leg of the pilgrimage. For more on the history of the Black Madonna, on the tradition of pilgrimages with sacred icons (based in the Old Testament), and on the Ocean to Ocean Campaign, visit www.hli.org/oceantoocean.